KL Rahul put on a virtuoso display, scoring an incredible 199 runs to take India to 391/4 at the end of Day 3 of the Chennai Test. England tried to fight back by claiming the wickets of Kohli and Pujara for low scores but Nair and Rahul ensured that the Indians finished the day on top. India, who had finished Day 2 at a score of 60/0 scoring at a run rate of 3, started the day with both openers at the crease in good nick. Both started well scoring a boundary and a six in two consecutive overs. The six was particularly pleasing on the eye as KL Rahul danced down the track to smash Liam Dawson for a maximum over long off. In the 29th over, India brought up their hundred - the first time in 32 innings that the Indians had managed a first-wicket century partnership. After the century partnership, the Rahul-Patel duo started scoring at a brisk pace with a boundary coming almost every over. But England's star with the bat, Moeen Ali, got the visitors the breakthrough when he sent Patel back to the pavilion. The Indian got a leading edge that was gobbled up by Jos Buttler at cover. 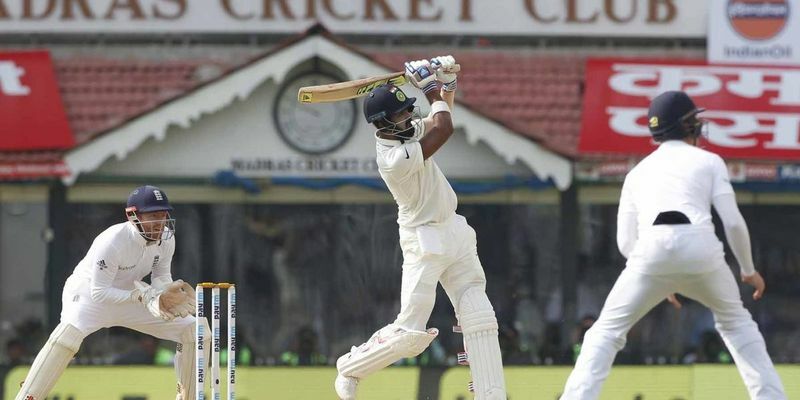 Cheteshwar Pujara appeared to be ready for the challenge as he scored two quick boundaries off an Adil Rashid over to take India into lunch with the score at 173/1. Pujara started the session off well with a couple of glorious shots that zipped past the ropes, but could not capitalize on the good start as he was dismissed by Ben Stokes. The ball, which at this point was 50 overs old, had started reversing and Pujara edged an outswinger to the slips where Cook took an easy catch to bring Virat Kohli to the crease. Kohli got his first four in the very first over he faced to put some pressure on the English. On the other side, Rahul brought up his fourth Test century - first in India - with a glance down the leg side. However, with the ball doing a little bit in the air, Cook decided to bring back Stuart Broad to the attack and it was the Nottingham man who got England the wicket that they desired. Broad continued with the same game plan that England had had for the Indian captain throughout the series - bowling outside off stump in the hopes of the getting an edge. Finally, Kohli drove at a ball outside off stump and Keaton Jennings took a simple catch at extra cover to send the Indian captain back to the dressing room for less than 40 - the first time it has happened in the series. Rahul, along with Karun Nair, took India's score to 256/3 as the teams broke for Tea. Rahul appeared to be well set at the crease as he took his score past 150, and India past 290, before England decided to opt for the second new ball. Jake Ball created a chance for the English in the very next over as Nair flashed hard at a swinging delivery that made its way to the slips, but Cook was unable to hold on to the catch giving the youngster another lifeline. Having scored just 17 runs in his first two Test matches, Nair brought up his maiden Test 50 with a stroke through the extra cover of a Ball’s ball. England had one more chance to claim Nair’s wicket when the Indian misjudged the pace of a ball from Ali and got a leading edge. Luckily, the ball dropped short of the Englishman, and the Karnataka man stayed at the crease. However, it was not to be the perfect the day for Raul as the opener sliced a wide delivery to gully just one run short of his double century. The duo had, however, made sure that India finished the day well on top taking the score to 391/4 with the game appears to be heading for a draw.